Compass account executive Paul Willcox (right) congratulates Clive and Lisa Wilson of Swallow Point Holiday Park in Somerset. 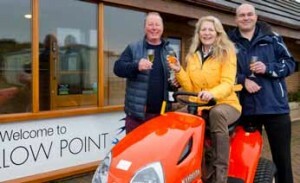 Four lucky holiday park owners have taken delivery of brand new ride-on lawnmowers, after being selected as winners of a prize draw organised by Compass Insurance. Hundreds of park owners and operators entered the competition when they visited the Compass stand at two major caravan shows in the north and south of England last September. The first four names pulled out of the hat have each been presented with a state-of-the-art Kubota mower. The winners were Julian Hiles from Friary Farm Caravan Park in Norfolk, Elspeth Sutton of Sandgreen Caravan Park in Dumfries, Nicky Colls of Brean Down Caravan Park in Somerset and Clive Wilson of Swallow Point Holiday Park also in Somerset. Adrian Scott, managing director of Compass Insurance added: “We are delighted that these four parks have won the ride-on lawnmowers offered through the Compass Insurance prize draw.